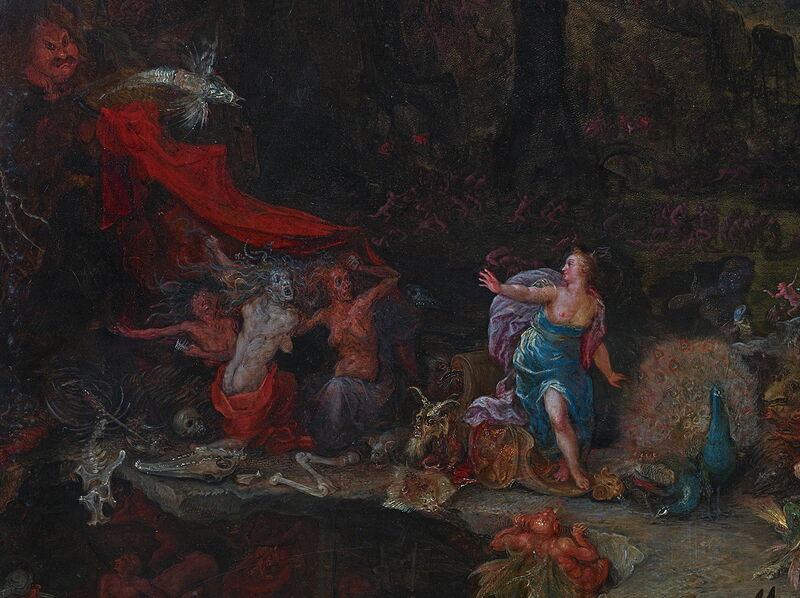 Jan Brueghel the Elder (1568–1625), Juno in the Underworld (detail) (1596-98), oil on copper, 25.5 x 35.5 cm, Staatliche Kunstsammlungen Dresden, Dresden, Germany. Wikimedia Commons. With the daughters of Minyas transformed into bats and no longer able to tell their tales, Ovid returns to his chronicle of the fall of the house of Cadmus. Semele became pregnant by Jupiter and was then destroyed when he appeared in his full divinity to her; their son was the god Bacchus. Polydorus, his only son, died young of an unknown cause. Autonoë was among those who killed Pentheus; her own son, Actaeon, was killed by his hunting dogs after Diana transformed him into a stag. Agave married Echion; their son Pentheus was killed by worshippers of Bacchus, including his mother and her sisters. Ino married Athamas, and they are the subjects or victims of this story. Ovid leads in with Ino’s family relationship with Bacchus, her own marriage to Athamas, and their two children. However, Juno is not happy with this, feeling that the family had still wronged her. She therefore seeks vengeance on Ino, wanting her to suffer the madness that had led to Pentheus’ death. Juno therefore enters Hades, passing its monstrous guardian Cerberus, and seeks out the Furies. Juno sees some of those damned to impossible tasks, including Titys, Tantalus, Sisyphus, Ixion, and the Danaids. She wonders why they should suffer so, but Athamas (who has actually done nothing wrong other than marrying into the house of Cadmus) should not. Juno engages Tisiphone, one of the three Furies, to bring Athamas down by driving him mad. Tisiphone readies her weapons, and visits Athamas in his palace. There she hurls two snakes from her hair at Athamas and Ino, and pours a poisonous concoction on them both. Athamas is instantly driven mad, convinced that Ino is a lioness, and their sons her cubs. 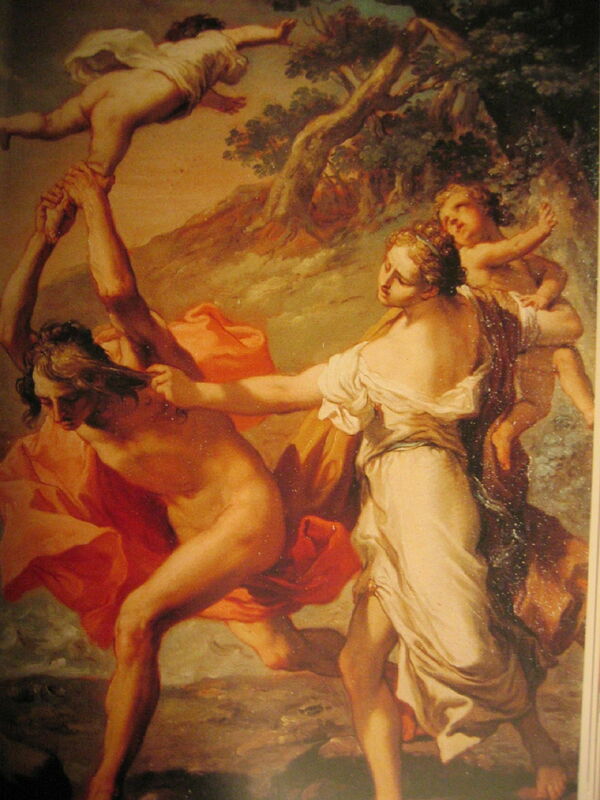 He snatches Learchus from his wife’s arms, and smashes the infant against hard rock. Ino, calling the name of Bacchus, flees to a high clifftop, still carrying their other infant son, Melicerta. Once there she launches herself towards the sea below. At this moment, Venus intervenes, and gets Neptune to transform them both into gods: Ino into Leucothoë, the infant into Palaemon. They thus vanish from the earth, and Ino’s friends and household, who have been pursuing them, assume that they are dead. skim lightly the dark surface of that sea. Ovid’s story of Athamas and Ino is not unique – it is told in other sources, and Leucothoë later plays an important role in the Odyssey – but in spite of its pictorial potential, it has been very little painted. 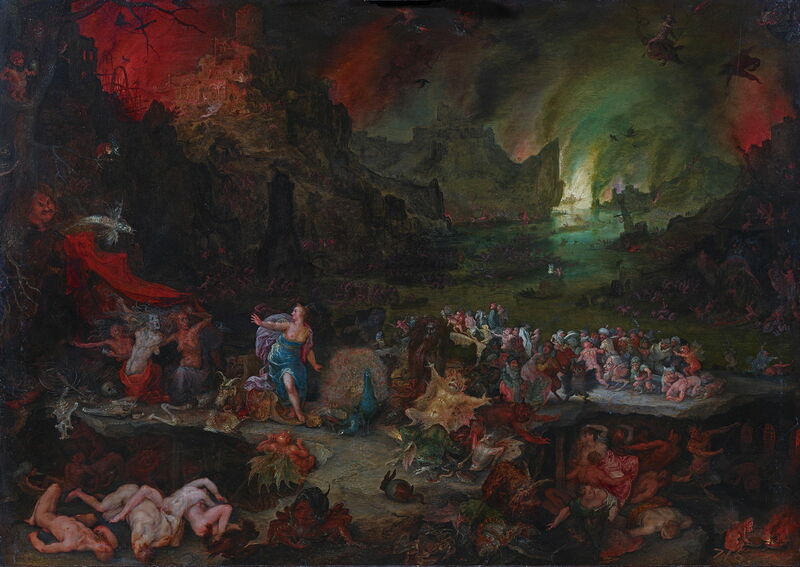 Jan Brueghel the Elder (1568–1625), Juno in the Underworld (1596-98), oil on copper, 25.5 x 35.5 cm, Staatliche Kunstsammlungen Dresden, Dresden, Germany. Wikimedia Commons. The only major work by a Master showing any part of it is, though, a real gem: Jan Brueghel the Elder’s Juno in the Underworld (1596-98). Brueghel’s vision of Hades rivals even Hieronymus Bosch’s apocalytic scenes, and comes dangerously close to losing Juno altogether in its sea of horror and suffering. Juno’s cool blue robes and a couple of peacocks stand out from the reds and browns, the monsters and the tormented. She waves at the trio of Furies, with their snake-filled hair and screaming faces. A few years later, Wouters painted another version which could only have been based on this original. Godfried Maes (1649–1700), Athamas Tearing his Children Apart (1664-1700), black chalk, pen and brown and grey ink, brown and grey wash, brown ink framing lines, some with watermarks, 18 x 24 cm, location not known. Wikimedia Commons. 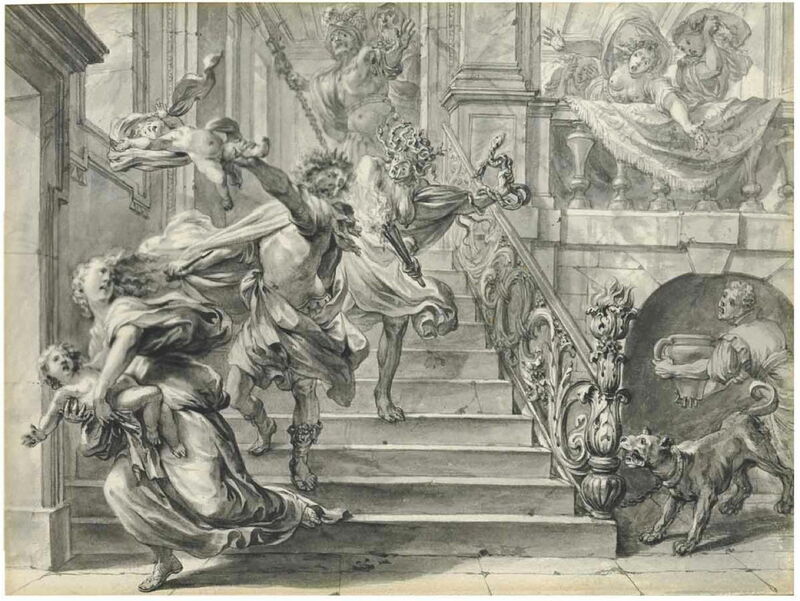 Godfried Maes’ Athamas Tearing his Children Apart (1664-1700) is a fine chalk and pen drawing showing Athamas dashing the infant Learchus against the palace walls, and Ino, clutching Melicerta, heading very rapidly towards the door in her bid to escape. To make his account even more explicit, he includes the figure of Tisiphone further up the staircase. I suspect that this was destined to be engraved and used as a print, as a couple of other drawings of this story were. The only two paintings which appear to have been made of this scene appeared in the same year; had they been French, I might have suspected that it had been the subject for the Prix de Rome that year, but both the painters were Italian, and I cannot find any reason for this strange coincidence. Gaetano Gandolfi (1734-1802), Athamas Killing Ino’s Son (1801), oil on canvas, 92 x 63 cm, Villa Molinari Pradelli, Marano, Italy. Wikimedia Commons. Gaetano Gandolfi’s Athamas Killing Ino’s Son (1801) shows Athamas wielding his infant son like a sledgehammer, and about to strike him against the ground with great force. Ino is holding Amathas’ hair, and the other son in her right arm. There is no sign of any Fury here. Arcangelo Migliarini (1779-1865), Athamas after the Fury (1801), oil, dimensions not known, Accademia di San Luca, Rome. Wikimedia Commons. 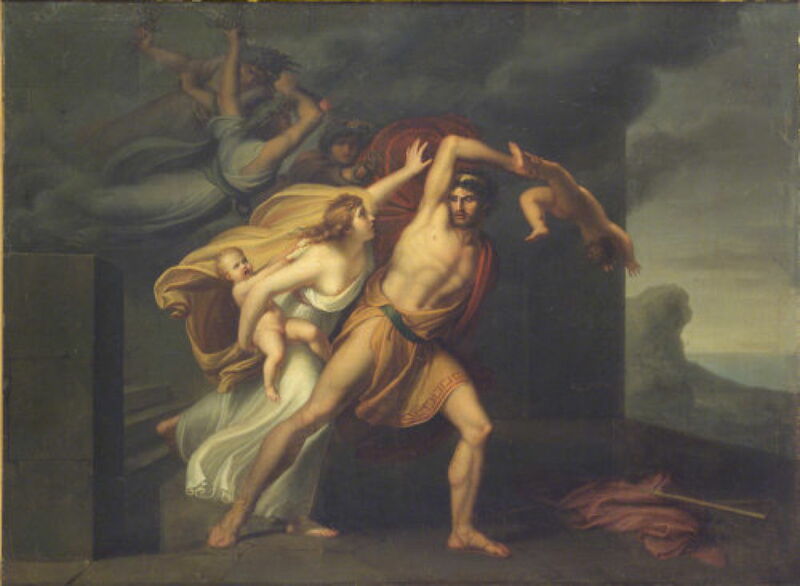 Arcangelo Migliarini’s Athamas after the Fury (1801) composes the couple and their babies quite differently, although Learchus is about to suffer the same violent death. Behind them Tisiphone is still floating around, apparently bringing distress to others in Athamas’ palace. At the far right is the cliff to which Ino is about to run. In fact, Thebes is not that close to the sea, something which was also overlooked in Ovid’s account. Ino’s transformation to a goddess is also a little confusing: Ovid has, through the daughters of Minyas, only just told of a Leucothoë who was turned into a frankincense tree, and the daughter of Minyas named Leuconoë. 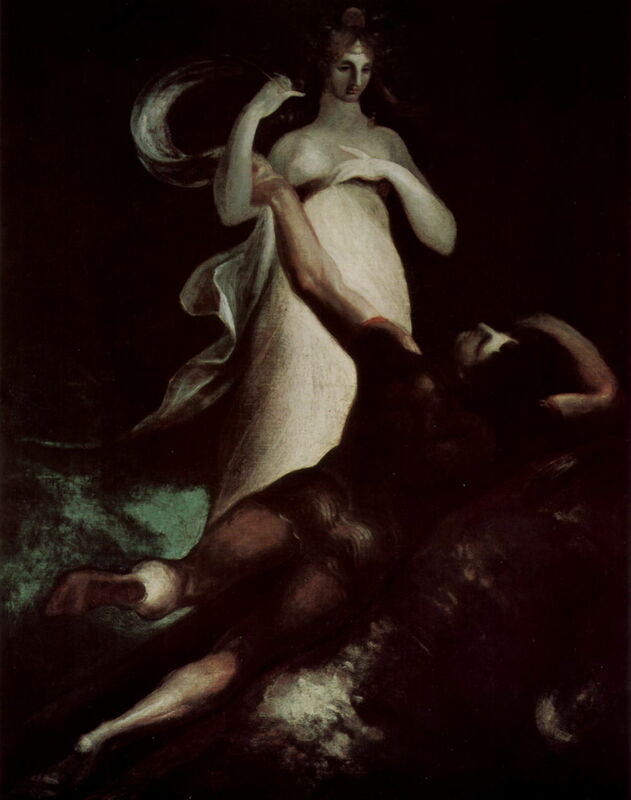 Ino was transformed into a sea goddess who is also known as Leucothea, who appeared in the form of a gannet to Odysseus when he was shipwrecked, during the Odyssey. Henry Fuseli (1741–1825), The Shipwreck of Odysseus (1803), oil on canvas, 175 × 139 cm, Private collection. Wikimedia Commons. That appearance has been painted more often, and Henry Fuseli’s The Shipwreck of Odysseus (1803) is a notably dramatic version of that, perhaps providing final closure to this story. Posted in General, Language, Life, Painting and tagged Athamas, Bruegel, Brueghel, Fuseli, Ino, Maes, Metamorphoses, myth, narrative, Ovid, painting. Bookmark the permalink. More new Mac malware expected soon: OSX.Snake?